Do you understand Hindi? Then you know what Happy Phirr Bhag Jayegi means, right? 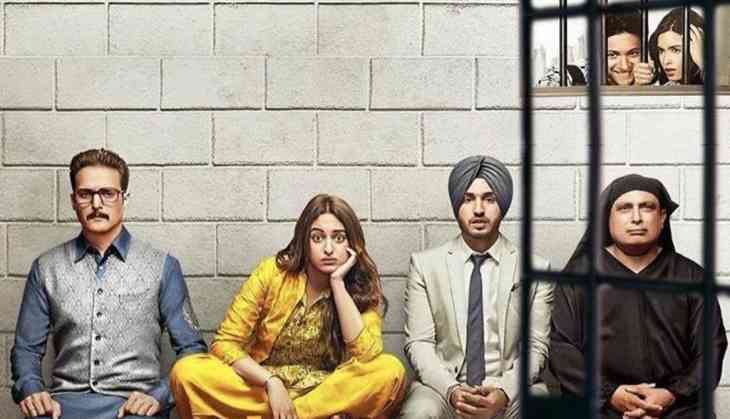 That's exactly what happens in Mudassar Aziz's sequel to his 2016 sleeper hit Happy Bhag Jayegi – Harpreet 'Happy' Kaur, this time two of them and in China – are on the run. That's about it for 2 hours and 16 minutes. With the help of a bunch of some kind souls the two Happys try to dodge a villain, who is supposed to be sloppy-funny. Aziz has picked up a major part of the original cast (Diana Penty, Jimmy Shergill, Ali Fazal and Piyush Mishra) and added the time-tested formula of mistaken identity to give the plot a twist. Once he establishes how Penty and Sonakshi Sinha are mistaken for each other it becomes an endless run towards the climax where everything is predictably sorted out. Aziz tries to bring in a geopolitical subplot of corruption into this that doesn't really work out. At one point it also seems the director also wanted to reunite Abhay Deol from the original cast but couldn't. The cast does what is expected of them: lots of running around, some slapstick, a few one-liners and generally act funny – almost like the films Priyadarshan used to make in the past decade. The premise being every joke will tickle somebody or the other in the audience. They do, but don't expect anything more. Unlike other Bollywood sequel, Happy Phirr does not simply try to milk the original. This one has its own plot, which is not an outright drag. Sunil Patel's camera does a decent job of showcasing China. But Aziz's screenplay isn't evolved enough to lift it from mediocrity. READ NEXT >> Late Ex-PM Atal Bihari Vajpayee to DMK chief Karunanidhi, list of gems that India lost in August will make you emotional!